As part of the Holocaust, the Nazi regime classified and discriminated against different groups of people based on certain characteristics, including: ethnic heritage, mental and physical disability and genetic background. In his book, Mein Kampf, Adolf Hitler promoted the idea that Germany should actively seek to create a master race which he referred to as ‘Aryans’. 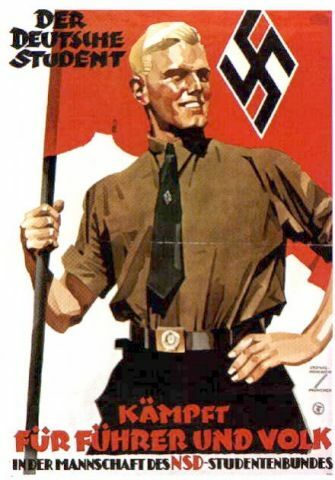 For Hitler, Aryans were northern Europeans who had certain genetic traits, including blonde hair and blue eyes. Hitler believed that Aryan genetic traits should be promoted and that all others should be restricted or removed from society. In order to achieve this, the Nazis practised the theory of eugenics, which is the idea that certain genetic traits should be promoted while others should be removed through selective reproduction. Eugenics developed as a theory along with the early development of genetics as a field of study, and while it was not unique to the Nazis, Germany was the country that practiced eugenics the most. Essentially, countries who practiced eugenics sought to eliminate certain human traits by preventing ‘undesirable’ people from reproducing. For Nazi Germany, the people with ‘undesirable’ genetic traits included: mentally and physically disabled people, the Jewish, the Polish, and Slavic people. The first victims of the Holocaust were mentally and physically disabled German citizens who the Nazi regime considered to be a burden on society. It was the view of Nazi officials that the care for these people was too expensive and they carried genetic traits that weakened the Aryan race. As such, the Nazis created the Euthanasia Program, which was designed to execute many of these people. 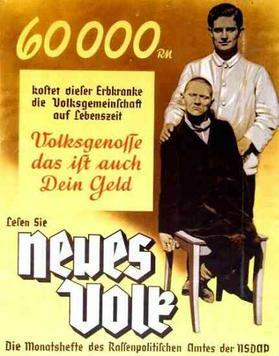 The poster reads: "60,000 Reichsmark is what this person suffering from a hereditary defect costs the community during his lifetime. Fellow citizen, that is your money too". Under the Euthanasia Program Nazi doctors passed judgment on a disabled person based purely on viewing the patients file. If 2 out of 3 of the Nazi doctors deemed so, then the patient would be euthanized, meaning they were executed. These people were executed by being gassed in the back of a truck that travelled between different mental institutions in Germany. Today, many historians view the Euthanasia Program as one of the first stages in the overall Holocaust and a clear example of Nazi eugenics policy. Another example of eugenics in the events of the Holocaust was the creation of the Nuremberg Laws. First passed in 1935, the Nuremberg Laws made German Jewish people second class citizens and banned sexual relations and marriage between Jewish people and persons of German blood. Officially, the Nuremberg Laws were known as the ’Law for the Protection of German Blood and Honor’. The goal of the laws for the Nazis was to limit the ability of Jewish genetic traits to spread and to legalize discrimination against Jewish people in Germany. Finally, the creation of the concentration camps and death camps, as part of the Holocaust, is based upon the principles of eugenics because the Nazis were attempting to exterminate all of the groups of people they deemed to ‘undesirable’. For example, during the Holocaust, which occurred from 1933 to 1945, over 11 million people were executed. In total, 6 million were Jewish people, while the other 5 million included several other groups, including: disabled people, homosexuals, communists, Soviet and Polish prisoners of war, gypsies, and other religious and ethnic minorities.